The SAP Selling and Distribution module has been gaining steady popularity in the marketing and supply management world as it has proved to be one of the best solutions to the selling and distribution challenges faced by most large enterprises. 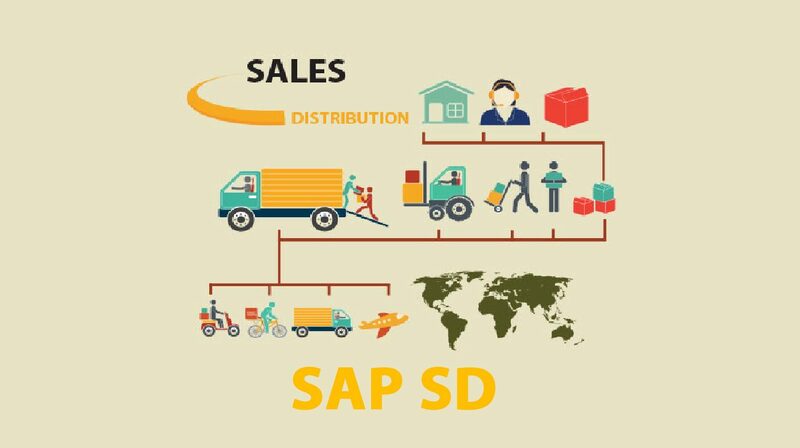 SAP Sales and Distribution is an important module of SAP system and handles all the processes of order to delivery. SAP SD execute the business processes used in selling, shipping, and billing of products and services. Why opt for The SAP SD Courses? Prepare for the SAP SD Power User certification exams. Become a professional SAP SD and a certified Power User consultant. Learn SAP SD in classroom or online. If you are not aware of the average SAP SD salary, then you must know that it is $120,000 P.A. Major leaders of top industries are now turning towards SAP SD. A few of the big names involve Accenture, Tata Technologies, Reliance Industries, and many more. The SAP SD course will make you capable of better handling of company accounts and will offer you a highly advanced approach to financial transaction reporting. Anyone who is a B.A. or B. Com, BBA, MBA – Sales/Marketing graduate, MTech. Anyone from Customer Relationship Management background. Zenfotec’ s professional trainers are SAP SD certified experts and are experienced in real-time projects. This SAP SD module is designed for job-oriented candidate who will be focusing on the industry ready curriculum from the starting of the training program. Once the candidate registers themselves for this SAP SD Power User Program, the registered candidate will have the access to SAP Learning Hub and SAP ECC server access for 3 months. The SAP PP course will be completed within regular classes and in weekend training classes. You can also opt for our fast track training program (over 5 hours daily). With recorded video training, the registered participant will be having an advantage of learning about SAP SD at your own convenience. The recorded videos are a contribution of highly professional and certified SAP SD consultants. The registered candidate will get SAP SD forums and email support for the 365 days of the year. Besides that, by paying a nominal token amount, the candidate will also get priority certification support and sessions from multiple instructors. Apart from that, we are also into Corporate Training so that any organization can train their own employees to work with their best efforts. For corporate training, we provide both in-class and online training. The SAP SD training will help in enhancing and sharpening the skills of an employee. We will ensure that your employees get the latest technological advancements in their own fields of expertise. 24/7 access to our digital library. Industry based SAP SD course content. Certification related SAP SD training material. Lifetime access to recorded SAP SD videos. Reasonable SAP SD training fees. The SAP Certified Application Associate certification exam validates that the candidate possesses adequate knowledge in various Logistics area to satisfy the requirements for the consultant profile. There are no such pre-requisites to register for this exam. Are you an official training partner of SAP ? We are associated with Dexler Information Systems Pvt Ltd who are strategic partners of SAP and have authorization to conduct training as per SAP Standards. We strictly follow all the terms and conditions laid down by Dexler Information Systems Pvt Ltd and offer genuine SAP Training and Certification. We have Sr. SAP consultants who are already Certified and working consultants, who share their knowledge with people who are interested in appearing for the SAP Certification. SAP certification exams can be conducted on cloud (SAP certification portal) or on premise by visiting Dexler Information Systems Pvt Ltd test centers. Do you provide access to SAP Learning Hub ? Yes, we do for the period of 6 months. Do you provide server access to practice ? Yes, we can provide you with SAP Live Access. For more information, kindly call us at +91 82 7719 3634. What is SAP SD ? What are the modes of training ? Instructor Led Classroom Training (ILT) – In this mode students attend the Live classroom sessions as per the training schedule. Assignments and course materials access is provided using the LMS / SAP Learning Hub. Students can also view the videos of the past sessions and post questions using the LMS system. Students can ask trainers question live during the session or offline using the LMS / SAP Learning Hub. 24×7 access to Support is available. Instructor Led Video Training (VLT) – In this mode students do not attend Live online sessions but learn from the Session video recordings. Assignments and course materials access is provided using the LMS / SAP Learning Hub. Students can post questions offline for trainers using the LMS / SAP Learning Hub. 24×7 access to Support is available. Self-Paced Video Training (OLT) – Self-paced video training program is designed to learn at your own pace. Students are given a access to the LMS / SAP Learning Hub and learn thru pre-recorded session videos. They access the assignments and materials thru the LMS / SAP Learning Hub. 24×7 access to Support is available. Do you assist in placements ? Yes, we do assist in placements. As we are purely into training, we have a reputation of delivering high quality of candidates to our partner companies. However, we do not commit on 100% job guarantee as no company or institution can ever guarantee a job. We can assist, not guarantee jobs. We do our best to get the good number of interview calls through our 50+ sister consulting companies we work with. But we do require your efforts for the same. We can guarantee that. The idea is very simple – Get better at concepts and with our resume and interview assistance, clear an interview and get a job. There is no shortcut then this. How SAP SuccessFactor Certification can help you as an SAP Professional? SAP Leonardo- When SAP and Internet of Things ( IoT) get the mix. “One of the best experience I have had with online training. Both the trainer and the SPOC was awesome and understanding. Trainer was very knowledgeable and was flexible and was able to deliver the best, both experience wise as well as subject wise. My 200% recommendations to anyone who want to proceed with Zenfotec.